Debian-Edu/Skolelinux is the international Debian distribution for schools. With only 4 questions it installs a whole school server with a bunch of services like Linux and Samba file-server, webserver, mail server, LDAP server, DNS server, LTSP, ... It can handle Linux thin- and fat-clients out of the box. The main work of the Debian-Edu/Skolelinux developers is done concentrated on the technical side of the project. Auto-partitioning, network discovery and auto-connection of workstations and thin-clients to central file shares and the user database are the backbone of this ease of use. With the growth of the project in 2005 and 2006, new members, new communities and new countries came together deploying Debian-Edu/Skolelinux to their local schools and their local culture. The KDE is their pre-configured desktop, the local teams are very proud to present a desktop in their native language. As a high contrast to delightful technical solutions in the background, the default installed KDE of Debian-Edu/Skolelinux 2.0 looks rather boring. The philosophy from Norway seems to be, that every school can easily configure its own idea of desired desktop. The problem of this concept is the lack of local know how, because KDE by itself is getting complex to configure. One of the solutions came from the French team, that pre-configured the KDE desktop for their schools. The result was not only one desktop, it was three desktops for different educational levels. Two of them are realized with KDE and a pre-configured Kiosk tool. The speech will show the new shift of Debian-Edu/Skolelinux towards the desktop and the importance of being able to pre-configure such a desktop. With examples from France and (if available) from Germany the different solutions for educational level desktops will be shown. Another topic will try to demonstrate the desktop requirements to konquer the everyday school. The last point will present the KDE maintenance on the Debian-Edu/ Skolelinux server side. Information on Skolelinux: in German,in English,in French. 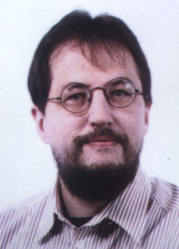 Christian Kuelker joined the Skolelinux project as an IT freelancer in 2004. His main tasks in the project are "The New Member Process", the BOA (board of applications) and the development of the new user administration tool in Germany. He travels through Germany as a developer and promoter of Skolelinux and takes part at gatherings in Germany, France and Spain. He also organizes events in the German test-center of Skolelinux. Christian Kuelker is a student of sociology at the University of Bielefeld and teaches Japanese. More information on Christian Kuelker.